Officer Sean Courter not ashamed to wear an American flag and blue tie representing police all over America. This totally disgusting piece of human garbage made his way onto the Bloomfield New Jersey Police department. If not for the dash cam victim Marcus Jeter would have been sentenced to prison. Officer Sean Courter was indicted on charges of conspiracy, official misconduct, falsifying or tampering with public records, and false swearing in connection with the incident and its aftermath. A third officer involved in the case, Officer Albert Sutterlin, pleaded guilty to tampering with records, took early retirement and awaits sentencing. A judge has denied a motion, filed by Bloomfield police officers Orlando Trinidad and Officer Sean Courter, seeking to dismiss a criminal indictment. Superior Court Judge Michael L. Ravin rejected the officers’ latest legal overture in a written decision on Monday, according to the Essex County Prosecutor’s Office. 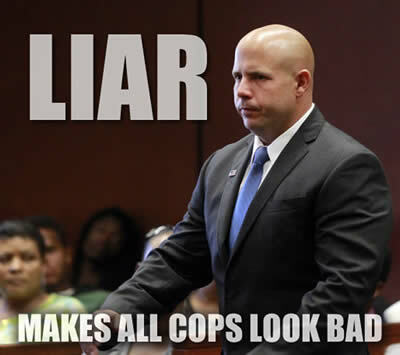 The indictment charges include conspiracy, official misconduct, falsifying or tampering records, and false swearing, regarding details of what happened when Officer Trinidad, Officer Courter and a third officer (who took early retirement) approached Marcus Jeter’s car on the side of the Garden State Parkway in 2012. In October 2013, the third officer, Albert Sutterlin, pleaded guilty to tampering with records and awaits sentencing. Officer Trinidad and Officer Courter also face civil proceedings in the so-called “dash cam” case, in which Jeter was initially charged with resisting arrest. The officers have been suspended without pay.